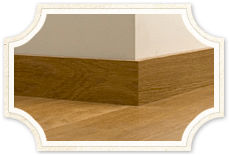 We provide a range of wood flooring accessories that not only can assist you with the floor fitting process but also allows your wood flooring to stand out and look even more beautiful. If you would like to find out more information about our wood flooring accessories, then please don’t hesitate to contact one of our staff by calling us on 01296 631208. 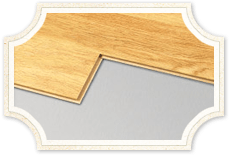 Quick-Step’s patented Incizo profile is a multifunctional finishing tool. One and the same profile can be used for all the finishes your floor needs. 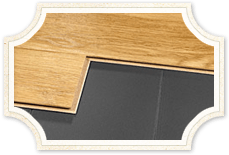 You create the profile you need for a perfect finish to your Quickstep flooring. You can use any spare pieces of profile for other purposes, you won’t have any excess profiles or leftovers. You always have the right solution at hand. in comparison with other types of multifunctional profiles. How can I link two floors of the same height? The Quick-Step solution for your stairs. 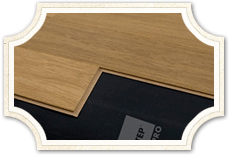 The Quick-Step Incizo profile can also be used to finish your stairs. How can I connect my laminate floor to a carpet, and have a beautiful finish? 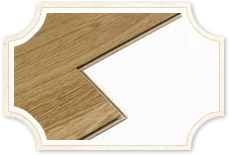 Use the Incizo profile, cut as a transition profile..
How do I finish my Quick-step laminate floor near a wall or a window? The Incizo profile creates a clean end profile. Seamless and subtle– matching colour to your floor and a discrete transition. Applicable to any kind of staircase– straight or turning, with or without stair nose, flush or non flush. Unlimited solutions for your stairs with the Quickstep INCIZO PROFIlE. This stair profile is available in a pattern and surface structure that perfectly match your floor. To be installed in combination with the appropriate aluminium sub-profile. (To be ordered separately). For the best installation of your floor without damaging it. 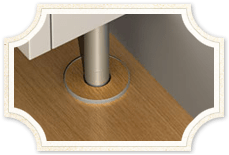 The Quick-Step tapping block – especially designed for the Uniclicsystem; adjustable spacers to guarantee the expansion grooves; crowbar in quality metal and sharp point -very handy in all situations. The installation set is also available with installation DVD. Place a floor panel and underlay next to the doorframe to determine the saw height. 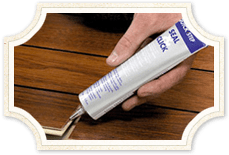 This multifunctional glue is specifically developed for all applications with the Quick-Step solutions. It is perfect for quick and firm fixing of all the skirting boards to the wall, and for use with the Quick-Step Incizo profile and its sub-profiles. Quick-Step Seal & Click has been especially developed to provide prolonged protection for Quick-Step Lagune against moisture when being laid in bathrooms. It is elastic, transparent, does not stick and gives further protection against water. Only apply on the short sides of the plank. 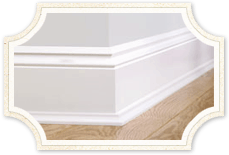 There’s a full range of skirting boards to match every floor and taste. 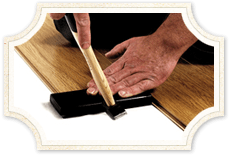 Each solution has been quality tested just like your new Quickstep flooring. This means you benefit from the full Quick-Step guarantee. That’s years and years without worries. 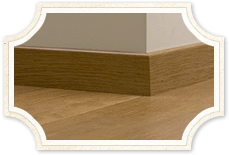 The clean lines of the parquet skirting board provide the final touch for any plank floor. The colour and structure of the parquet skirting are identical to that of your floor. On the back of both skirtings, there is a groove to hide phone or computer cables. 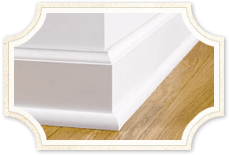 A quality skirting board for every interior. An extra high skirting board. An ideal solution for renovations. 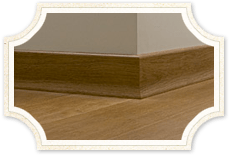 A traditional skirting board, which is ideally suited to hide a wide expansion groove. 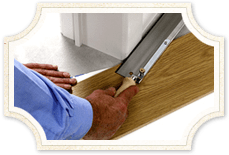 No need to remove existing skirting boards, just cover the expansion groove with this handy solution. Use our self-adhesive laminate tape to finish the sides of staircases, skirting boards and profiles. A perfect finish to your floor. To finish heating elements and pipes in harmony with your floor, our one pipe cover solution is suitable for different diameters – either 15 mm or 22 mm. Check your diameter and finish with a laminate round that matches your floor. This skirting board with patented Incizo technology makes it possible to show your creativity and add that little extra touch of individuality to your interior. Go for a classic or modern look, choose the height and colour yourself, and create a look and feel that matches your own taste. Keeping your floor in top condition is easy. Quick-Step laminate is not only easy to clean, it’s hygienic too. In fact the sealed surface prevents bacteria accumulating on the floor. This is good for the prevention of allergies. We recommend dry cleaning the floor with the Quick-Step microfibre duster. Occasionally damp cleaning can be done using a slightly wet mop. 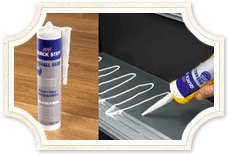 All Quick-Step floors are easy to maintain and keep clean, with the purpose-made Quick-Step cleaning kit. Practical and easy to use, it comes with an adjustable handle, washable microfibre mop and cleaning product (750 ml). You can use it dry or slightly wet. Quick-Step Cleaning product 750 ml. Stubborn stains (permanent marker, shoe polish, etc.) are removed in no time with Quick-Step Force. Light damage is easily repaired in the original floor colour using Quick-Step Mix & Fix. Available in 3 versions: dark wood, light wood and non-wood designs. With one version you can make 24 different colours, to restore the damaged plank quick and easily. 1 tube of repair paste. 2 bottles of pigment and a spatula. 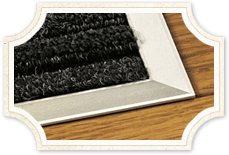 Quick-Step has a doormat that fits neatly in your hallway and prevents grit and dirt from coming inside your home. Easy to install, and easy to keep clean – the door will open effortlessly and without any obstruction. Score reduced transmission sound: Delta lw* = 19 dB. This underfloor is produced from stable wood fibres. Levels out the unevenness in the base-floor. Perfect for installation on wooden floors. Not to be used with floor heating. 20 panels/pack = 10, 1 m². Double-sided damp-resistant membrane with reinforcement. Fewer grooves when installing thanks to its larger surface. Protects against rising damp. 5 x 5 m = 25m². 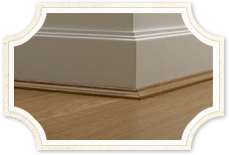 Why you should choose a Quick-Step underlay? A Quick-Step underlay absorbs aggravating noises like dogs’ paws and claws, high heels and loud music. These top-quality underlays will maintain their original thickness, and the result is optimum noise reduction for years and years. Your floor is protected against rising damp. Small irregularities or damage to the base floor are easily compensated with a Quick–Step underlay. 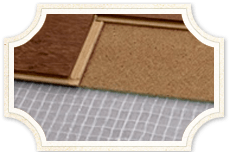 The smooth surface of the underlays prevents parts of the underlay from getting stuck in between the Uniclic tongue and groove during installation. 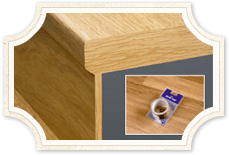 Moreover all Quick–Step underlays offer a stable base protecting the Uniclic click system. 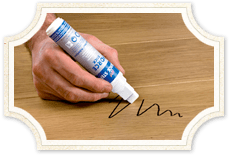 A Quick-Step 2-in-1 underlay will cut preparation time for the installation of your floor in half. The damp-proof membrane (DPM) with adhesive strip has already been integrated into the levelling underlay. This will save you a lot of time and effort. 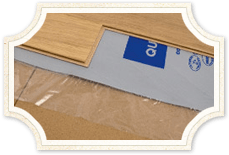 Quick-Step underlays comply with all the European standards for underlays. They are tested to ensure that they do not produce any unpleasant odours or harmful gases when warmed.